It's the end of June and time for another update. Working with Immortal Works on the publication of Dragon Ascending has been great. It's fun to work with people who are excited about what they're creating in the world. I've also begun slowly, but surely, putting what I've learned about self-publishing into action for the Viper books. It's fun seeing that starting to take shape as well. I never expected to be playing in both of those realms of publishing at the same stages at about the same time, but it certainly has been educational! I'm learning so much and getting to know interesting new people. My efforts to find balance in all the busyness have been helped along by my new kanban board, which was inspired by Sarra Cannon on her Heart Breathings videos over on You Tube. Check her out if you get a chance, she has some great advice for writers. My new board was prettier before I stuck sticky notes all over it, but it sure is gratifying to watch the sticky notes migrate from the top to the bottom as tasks are completed. And it's definitely easier to stay focused on what I need to be doing now, knowing that if it's not on the board it can wait. Last week, our family took a road trip up to Montana to visit my parents and one of my brothers and his family. Some members of our family have difficulty traveling, so we don't do it very often, and this was a rare treat for me. Not only did I get to help my little nieces and nephews build a Lego cyborg army, I also had fun playing multiple rounds of "Werewolf", and checking out a genuine secret room behind a swinging bookcase. One of the highlights of the trip was going for a hike in the back country up in the Montana mountains. It's something my family used to do when I was growing up, and with my father along it was definitely a trip down memory lane. 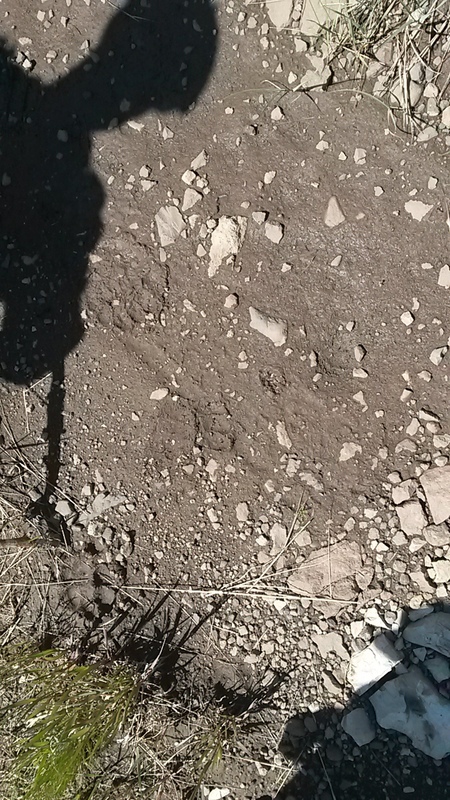 The photo below shows a muddy patch in the trail where we stopped to look at some animal tracks. If you look closely next to the shoulder of my father's shadow, you can see the hind foot print of a bear. Below and a little to the right of that is the bear's front paw print. Slightly up and to the right from there is a little bitty bear cub print. And near the bottom, by the grass, you can see where Dad is pointing out a wolf print with his walking stick. Elsewhere we saw prints of elk and deer as well as some smaller animals. There really is nothing quite like truly wild wilderness. During July, I'm planning to do a PeNoWriMo [Personal Novel Writing Month, modeled very roughly on NaNoWriMo, which I've never done because November is challenging enough as it is] with some friends and see how much of a first draft I can crank out for book two of the Vanir Dragons series. I'm aiming for at least 50,000 words; the novel is going to be longer than that, but 50K would be a good start, and that's what NaNoWriMo uses as a target. Thank you for all your support and encouragement. Writing is a solitary occupation in many ways, but I could never do it alone! Vanir Dragon Series, Book 2 - I've finally managed to wrap my brain around this book and get my little plot duckies in a row. I'm excited to start drafting this starting on Monday. This is going to be a fun story! Dancing with the Viper (Viper Series, Book 1) - My shiny new editor, Julie, has been helping me untangle the ending of this one, which has been a sticking point since I first wrote it. I am very happy with the results. We're now in the process of a final polish of the text, and in the meantime I'm tackling the learning curve for cover art and interior design and formatting. Self-education - There is always more to learn. On the craft side, I'm focusing on learning and building better pre-writing and outlining skills. On the production side, I'm dusting off my art degree and updating my cover design skills, and I'm learning about formatting and interior design. Dragon Ascending - This book is all edited and has been sent over to the production side of Immortal Works for cover art and interior text formatting. I've been told I'm going to see a cover very soon. I've seen the art they're planning to use, and I'm excited to see it worked up into a cover. I'll share pictures as soon as I'm allowed, so stay tuned. In The Viper's Garden (Viper series, Book 3) - This got a bit wobbly as I was working on drafting it, so I sent what I had to some trusted friends for feedback. This project is on the back burner while I work on some higher priority projects--and while I ponder how to best fix the issues that were pointed out by my trusty alpha readers. Viper Novella (for invitational anthology) - Sadly, this whole project has been put on hold indefinitely. That's okay, it happens. I will probably still write this story at some point, but for now, other projects need to take priority. Catching up on some cleaning and household tasks that have gotten out of hand during the school year. Homeschool planning for next year. Kids. They're awesome, and I love them, but they're distracting as all get-out! And their little dog, too!